Candidates with relevant O’ Levels result IN NOT MORE THAN TWO SITTINGS AND who scored an aggregate of 170 and above in UTME for all courses. 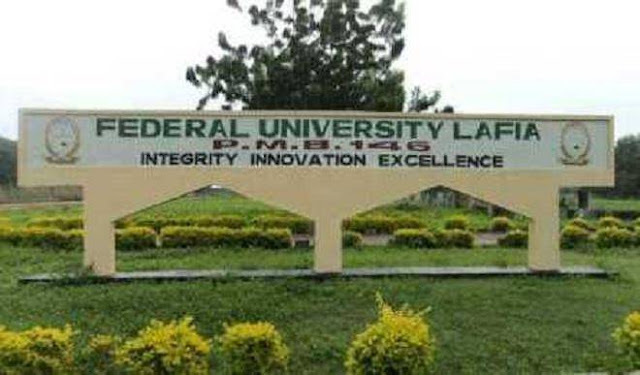 Must have chosen Federal University Lafia as their first choice. Candidates for Direct Entry (D.E) Admission will need to input both their O’ Levels and higher qualifications accordingly. Registration for the screening exercise will commence on Monday, August 6, 2018 and close on Monday, August 20, 2018. Applicants are required to pay a sum of N2,000.00 for the screening exercise. This excludes bank administrative charges. To make the payment, candidates are advised to visit the University PUTME registration portal putme.fulafia.org and Generate a Transaction Payment Slip to pay via Remita, or print the slip and proceed to any of the designated banks for payment. Candidates are to use their JAMB registration number as their username and their respective states of origin as password to login. After making payment, candidates are to come back here putme.fulafia.org to finish their registration. A transaction ID will be generated for you, pay via Remita or print out the slip and go to any of the designated banks and make payment. Upload your true passport size photograph in JPG format (not more than 100KB) and O’level results (where available). Choose awaiting result where applicable. Ensure that your photograph is uploaded. if you experience any problem with login to the Portal, uploading your passport photograph or O’Level results contact us through info@fulafia.org or Call us @ 07061629193 or 09051426442.